Want to update your kitchen? Considering a small project like refinishing cabinets or a totally new space complete with granite countertops, hardwood floors, stainless steel appliances and more? Whatever size project you have in mind, Virtual Architect's kitchen design software gives you the easy yet powerful creative tools needed to turn your dreams into reality today! No Design Experience Necessary – Using a wizard-driven interface with drag and drop simplicity, Virtual Architect's kitchen design software makes it easy - PLUS, there’s FREE Virtual Architect How-To Video Tips included! Fast! Design, customize and furnish in 3 easy steps! Easy! No design experience necessary, plus video tutorials for a fast start! Versatile! Perfect for any interiors and exteriors! Powerful! 360° QuickTime panoramas with Virtual Walkthrough! Fun! Complete library of 3D objects and materials! Design your new kitchen entirely in 3D, simply by dragging and dropping appliances, materials and accessories right into the workspace. Kitchen Ideas – Need a countertop that goes with your favorite wall color? No problem! 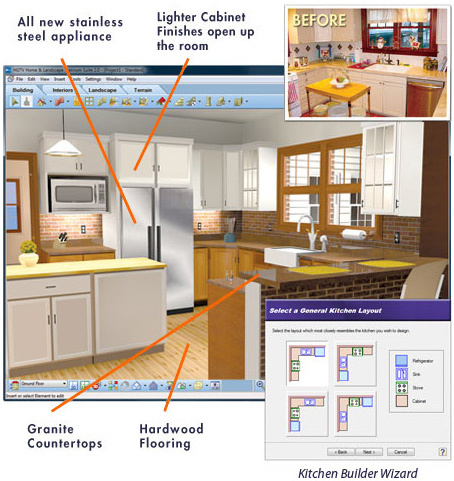 Virtual Architect kitchen remodel software comes complete with kitchen ideas and tips for designing beautiful and functional spaces. Photorealistic 3D Views – Virtual Architect's powerful 3D home design software lets you take a virtual tour and experience your newly designed kitchen in brilliant 3D! Start Redesigning Your Kitchen Today!